When I went to Jose’s house and had him sign several things, I brought out a fielding glove. He tried it on and told me he liked it & wanted to trade me. Of course, I was over the moon about this, and told him he could just have it. After a while, he said it may be too small but hopped up out of his chair anyway, and brought out his glove. A glove that he used in games nowadays that he plays in! He spent a lot of time inscribing and signing it as well. This baseball came straight from Rickey Henderson’s possession! 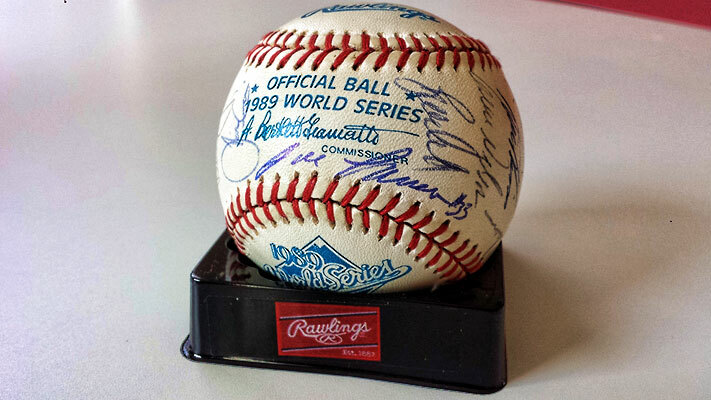 This official 1989 World Series baseball is game used, and signed by all the members who played in the world series except for Lance Blankenship and … you guessed it … Jose Canseco. I was able to send my prized possession to the Oakland Athletics front office to have Lance sign it, and brought the ball with me to Jose’s house so he could sign it in the spot I had requested. Jose’s speed is often overlooked, due to his incredible power. In his book, Jose mentions something about him being faster than Rickey Henderson in a certain type of race. I asked him in person, and he confirmed! 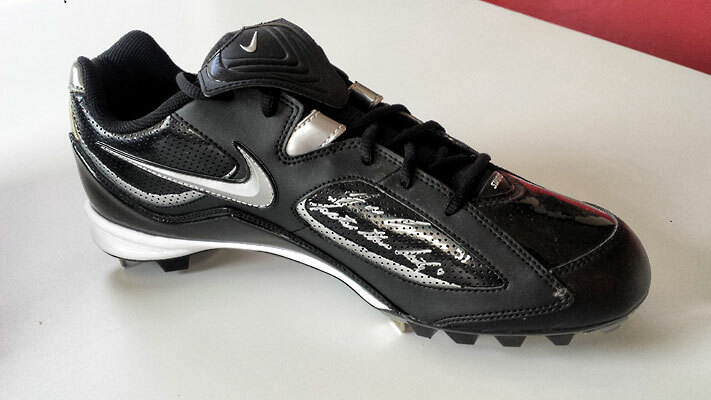 So I requested that he inscribe this player-worn cleat with “Faster than Rickey”. Classic! 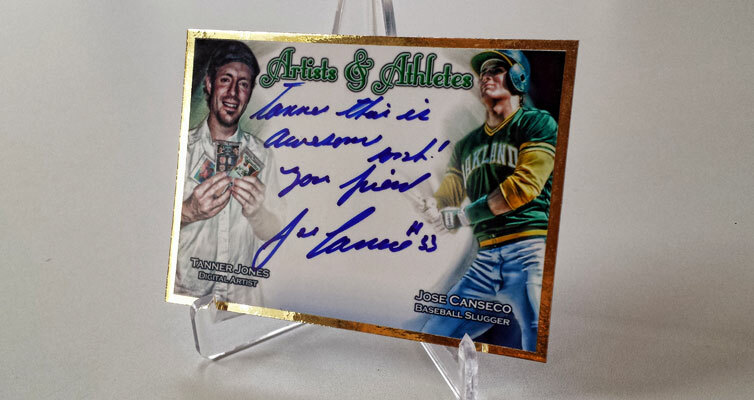 What’s better than being on a baseball card with your favorite player? How about when your favorite player personalizes it to you by complimenting your work and saying he is your friend! What really excites me is having jerseys and hats of every single team Jose signed with, as well as gloves, batting gloves, cleats and more … all worn by him! 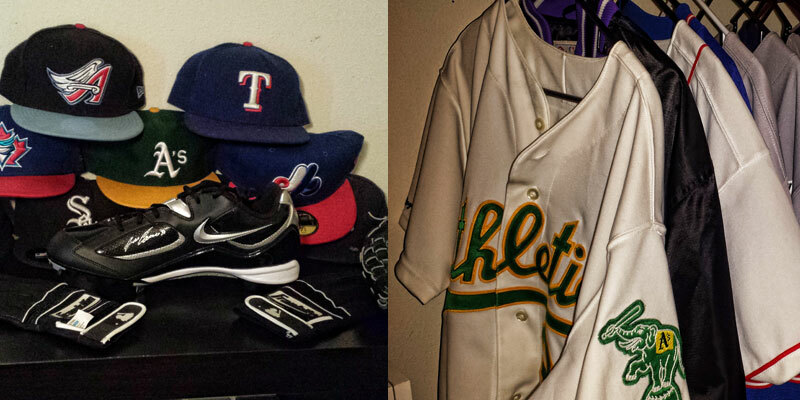 Not pictured are the pieces of the game used bat I cut up. This gives me what seems to be endless material to make tons of customs for my personal collection! This bat isn’t game used, but it still means a lot to me. A number of years ago, my wife got it for me as a complete surprise for Christmas. 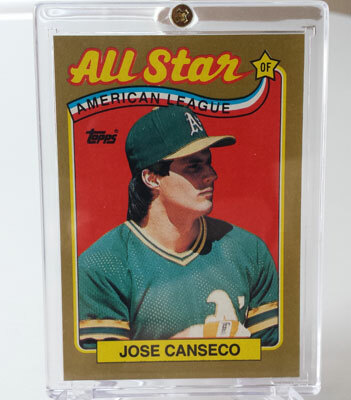 I was over the moon, and this was years before I had even really begun collecting Canseco as much as I do now. A few years ago, I signed up for a photo shoot with Jose, and had him pose with the bat. I guess you can say it is now “event used”, lol! Never would I have dreamed that I would be hanging out with the guy I was paying $50 just to take a picture with a few years later at his house. Test issue cards are known to be quite valuable. The 1990 Donruss Aqueous could likely fetch $500 to $600. This card, to me, is one of my favorite baseball cards in my entire collection. Not only does it predate the Aqueous; it is the only one I have ever seen before. For a photo gallery of all my favorite cards, Click here! Your collections awesome! I recently just got all my baseball card stuff from my parents house after 20 years and I think I might have some sweet Canseco stuff you’ve never saw!